Velázquez was eighteen or nineteen when he painted this remarkable picture. It clearly demonstrates his flair for painting people and everyday objects directly from life. His fascination with contrasting materials and textures and the play of light and shadow on opaque and reflective surfaces resulted in brilliant passages of painting, especially the eggs cooking in hot oil and the varied domestic utensils. At the start of his career Velázquez painted a number of these kitchen or tavern scenes, called 'bodegónes' in Spanish. 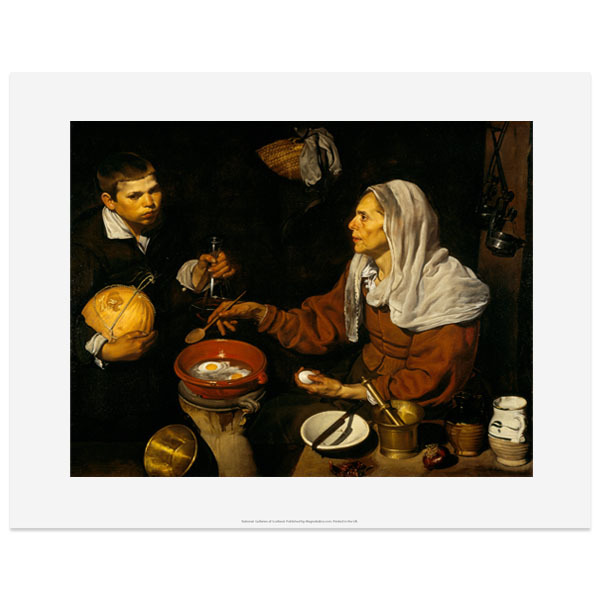 Fridge magnet featuring artwork An Old Woman Cooking Eggs by Diego Velazquez, 1618. From the collection of the National Galleries of Scotland.